On the lot, there are many kinds of shopping carts we must face, some being more dangerous than others. Here you will find a description of the different species of buggies. Normal Buggies: They all look the same and are relatively harmless. One-seat Baby Carts: An annoying species. Can almost never fit them on a line. Will only fit on the front of a line. Two-seat Baby Carts: The spawn of Satan. Evil to the nth degree. Cannot fit them anywhere on a line. Must be pushed by itself. Vic Carts: Name derived from their creator. Will not roll correctly because of a bent wheel. 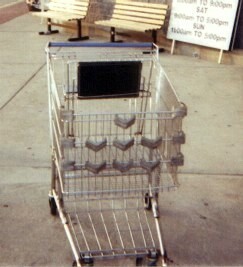 Terminator Carts: Scares customers off because the corners are covered in the small gray rubber "car ding" protectors. Must beware. 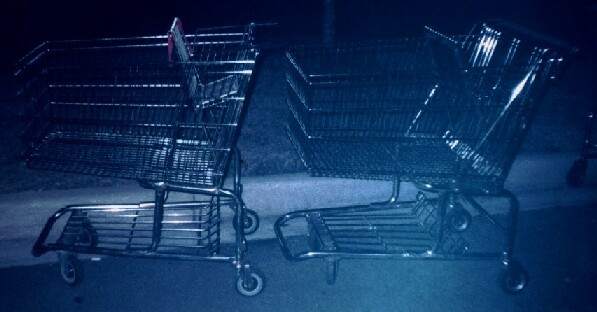 Destroyer Carts: An advanced species of the Terminator Buggies. Along with the rubber protectors all up and down the corners, it has the protectors all over the front sticking out. Brings fear in the eyes of customers and Cart Crew members. Have been known to attack. Suicide Carts: A sad breed indeed. No one knows what drives them to jump off the cliff into the Pet Depot parking lot, or to fall off into the drainage ditch. Therapy has been tried, but to no avail. Their depression just cannot be cured. Like lemmings, these buggies slowly make their way to the edge of the cliff, pondering the point of their existence. 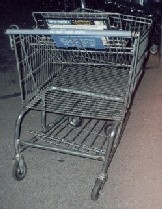 Cart Lag: This occurs when the cart flap goes under the next cart, so as to keep you from being able to push it through. Very common disease among the carts. The Winn-Dixie Cart: Floating around on the lot, there is a single Winn-Dixie cart. Who knows how it got there. 98s have concluded that it was sent there by sinister forces to spy on the cart crew. The infamous Winn Dixie cart compared to a standard Wal-Mart cart. The Spawns of Satan after a battle with Gertner. Evil lost to "Good". This cart has definitely been attacked by the destroyer or terminator. Rear view of cart on the left.